Miss Baby: Did you take a look at the other Bible paper (with the fish)? 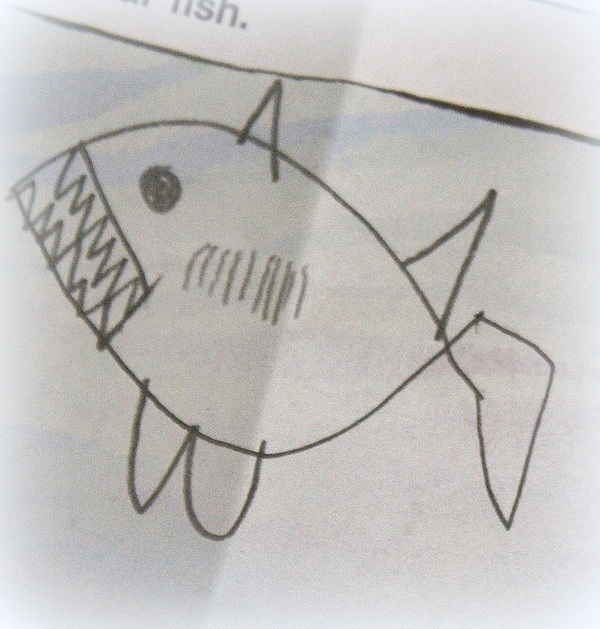 Me: Yeah, you were supposed to draw a fish. 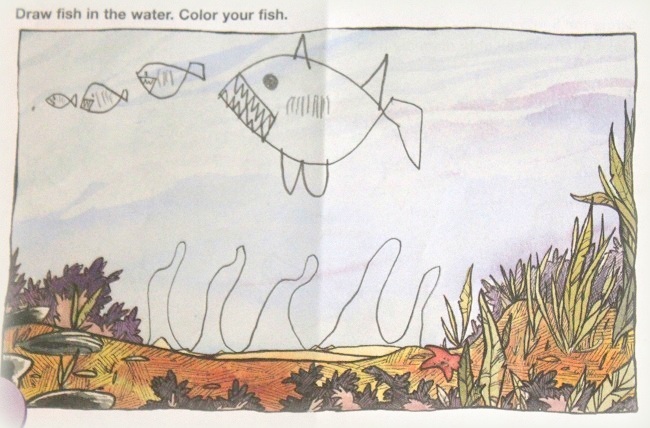 And… you drew a shark? Miss Baby: Oh, Mom – we could draw anything on there as long as it’s under water. Miss Baby: Can you see that it’s a food chain? 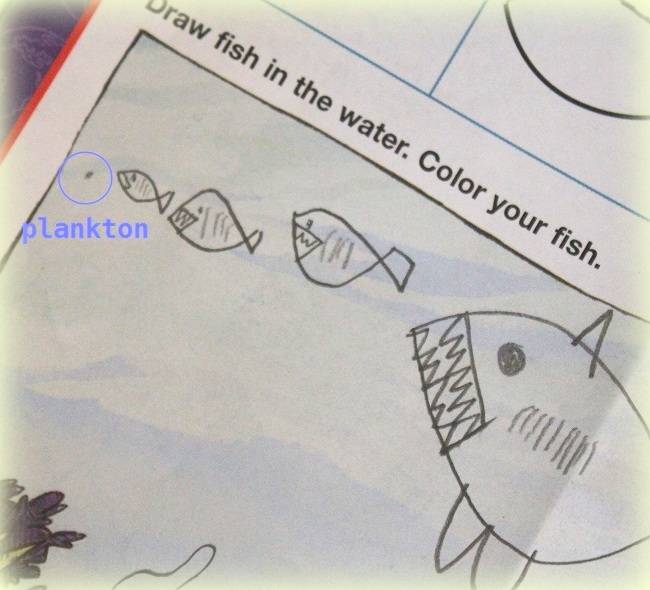 My head was spinning – instruction says to draw a fish… who said anything about a food chain? I took a serious look at the picture for the first time. FOOD CHAIN? Sure enough, it’s a food chain, sort of…. I think. Miss Baby: See? Plankton are at the end of the food chain. [See circled dot in picture]. Still spinning, my mind frantically scrolled through all the “scientific” p-words – platelet, plutonium, pulmonary, planet, pipe cleaner, panda, plankton?! …. Oh, plankton – that’s right, plankton! Me: Oh yes, plankton — the quintessential element of the aquatic food chain! I am not a perfect Mom – that’s a fact. I am a Mom who works too much. And I am painfully aware I am not the most patient Mom around. BUT… I was reminded again to not blow off my child’s art work. Thus a switch-a-roo on the fate of that particular school paper: Trash bin to Keepsake box. p.s. Oh, the knowledge out there waiting for us to learn about and explore including planktology here! Meanwhile, I have been playing with these fabrics. They are Nancy Gere’s Chambray Rose from Windham. These fabrics are gorgeous — they are like the perfect fusion of denim and floral. The focal print has the look of floral printed on denim. They are a little different from the usual floral prints, but very pretty. Click here to view the fabrics in case you are interested in getting some for yourself! And… if blue/lavender aren’t your colors, check out Nancy’s Carmen red fabrics here. I have some – and they are absolutely GORGEOUS! I have a few Chambray Rose fabric pieces (focal print and coordinates) left from piecing my quilt — if you would like them, please leave a comment in the comment section. One of you will be picked to receive the fabrics. This entry was posted in General, Quilt Pattern, Quilts & Projects: Upcoming. Bookmark the permalink. These are exactly my colors — would love to give them a new home! What lovely fabric. My girls are 38 and 29 but I remember oh so well those drawings that were so sweet. Still have a few. Oh, the things children think of! So happy Miss Baby pointed this out to you. Can’t wait to see what you make with these lovely fabrics. Would love any scraps you are willing to share! You are an AWESOME mom! You give her love and experiences, and that’s why she knows about food chains and plankton, and how many gills a shark has (great teeth, by the way). You both are totally awesome. I’m glad you are keeping this, and have documented the conversation on your blog, and I would love to have some of this collection. I noticed it before, and admired it. I’ll have to see if my stores have any. And G needs to be in 4th grade, lol. She’s way too smart for 1st. Hugs! what a neat story! Savor those moments, and those memories…and those special papers! love the chambray Rose fabric too…so nice of you to share! Beautiful fabrics, wonderful daughter. I’m sure she’ll continue to amaze you! I do realize not every piece of artwork, nor paperwork can be saved, but I’m so glad you saved this one. I’m totally blown away. Food Chain? Plankton ? As a scuba diver I will confess there are many adults that have no idea about the underwater food chain, especially plankton. And, I know Miss Baby is too young to be a scuba diver. I wonder if her teach has caught on how very special she is. The fabric bundle is beautiful. I look forward to seeing what you create with it. Oh, I love reds!!!! Those are so pretty. Miss Baby is paying attention to nature….loved her picture and food chain analogy. I think it a brilliant picture and so glad you kept it. And thank you for sharing such lovely fabrics. Who knows…. this drawing could be a future quilt design! Love kids and their art work!! Thank you for sharing the fabrics. I would love to see what I could create with them! Out of the mouth of babes…. I love that age! Their little minds are thinking, thinking. What a sweetheart! Love almost anything denim and floral. Your finished project will be beautiful, as they always are. Thanks for sharing! That is an absolutely fabulous piece of artwork – how smart Miss Baby is, showing the food chain! I love those fabrics and would have fun designing something with them. OH! How I would love these fabrics and I can see a pinwheel pattern with the flower fabric. Forgot to tell you Wendy–to start a scrapbook of her drawings and over the yrs. she can look back and admire her many art creations. Plus as she gets older you can make a quilt of her drawings. Take pictures of the drawings and transfer to cloth- I have seen pictures turned into quilts from PreK – her senior yr. I think that is how they do some of those things. She is a great artist plus she has an eye for color. Aren’t the thought processes of children just amazing. Keep encouraging Miss Baby’s creativity and imagination. The Chambray Rose fabrics are so soft looking. 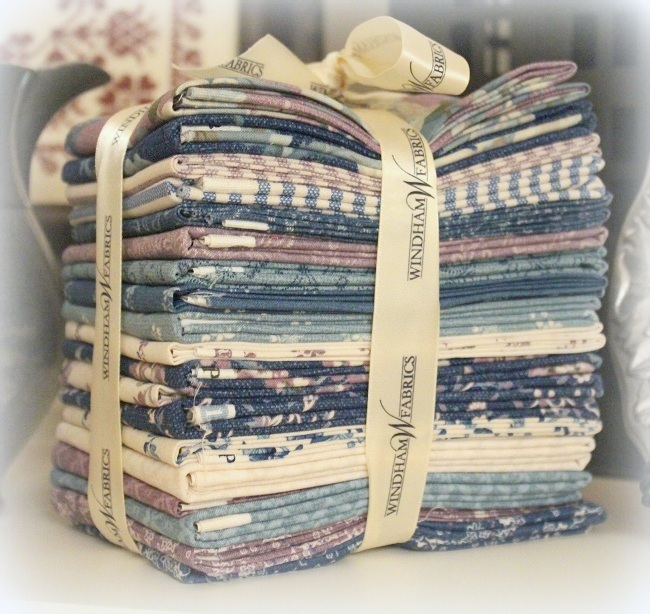 These Chambray Rose fabrics are beautiful …. and would coordinate perfectly in my family room décor! What a fun story Wendy! BTW, Miss Baby is quite good at drawing. Budding artist you have there! Hope she is still doing cross stitchery. Oh my, I saved in a box– er, boxes, lots and lots of pictures. They are filed somewhere in this house. You have to save everything :-D Wendy. Ah. My daughter recently had this dilemma with her two-year-old son’s first family portrait. Unfortunately it was drawn on the wall when she wasn’t looking. Three chalk lines. “Daddy tall, himself small, and Mommy tall, tall, tall,” which pretty much describes them exactly. :-) We suggested she take photos, wash the wall, and for goodness sake hide the chalk! I love that story…my girls are 23 & 28 but some of their schoolwork still melts my heart. Thanks for chance for new NancyGere fabric. Cherished time with your daughter, how wonderful! Time passes too quickly and one day her artwork will bring back treasured memories. Maybe you could make a fabric food chain of your own! Love the colors! I am collecting similar fabrics with a quilt in mind. Oh boy…you are in for it my dear! You will be learning a lot from your little professor. I love the looks of those fabrics but don’t enter my name in the giveaway since I wouldn’t know what to do with them…Have a great week! Miss baby is a very smart girl! That picture is a real keepsake. Thanks for the chance to win the fabric, it looks lovely. Don’t you love what the little ones say? My g/dau has come up with some good ones! The last one was …”People with really big afros..they should check their hair for guns” good idea..
And she is 8 1/2. Love her! Lots of memories in the making. It’s so fun to look back at those papers 😊 Those fabrics are so pretty. Crossing my fingers. Seems like every time I see a fabric I love, it is from Windham–often from Nancy Gere. Her Chicago World’s Fair line from several years ago may be my favorite collection of all. I love all red fabrics. Every quilt I make has some red in it. And I love children’s art work also. I still have some of my twins art work, and they are in their 40s with children of their own, whose art work they are now collecting. Out of the mouths of babes! My grandkids say the darndest things. :) Would love to play with these fabrics. They are beautiful. I got such a kick out of reading about the fish and food chain! Hold dear to every memory you can, they grow up so fast. Such beautiful fabrics, I would love to have them! Thank you for sharing and have a wonderful creative day! The fabrics are beautiful. Look forward to see what you have created from them. Those are my Comfort Colors the Soft colors of Denim and Lavender and Oh So Pretty…Thank You ! ! Beautiful colors and fabric. I’d love to win. I still have school drawings, what masterpieces they are too, from my son now 41 and my daughter now 35. Wouldn’t throw them out for anything. How precious children are, they have a knack for saying the unexpected. Oh yes, I certainly would like those fabrics. I just know I will find something very creative to make with them!! I loved the drawing, great attention to detail! I’d love to win the fabric, beautiful colors! I LOVE what I can see of those fabrics! I’ve love to win the leftovers! I know what you mean about saving papers. I used to keep every scarp of my son’s until I realized that I would soon be overrun if I did. Plus, the more I keep, the less likely I am to look back at them all. So I became more choosy. I am amazed at how Miss Baby’s mind works! A++! I love to see how children interpret their world through art, the details they notice and include. I just clicked through to the web site to look at the fabrics and love them even more! Oh, I LOVE the Chambray Rose line…it’s so delicate and so pretty. I’ll have to admit reading the post I laughed out loud! Miss Baby is absolutely brilliant. I’ve been impressed with her stitchery but now with her intelligence as well! The apple doesn’t fall far from the tree…she takes after her momma! Blessings…thank you for sharing this delightful moment with us. You can play “Are you smarter than a 1st grader” & lose!! Smart kiddo you’ve got there Wendy! Wendy, I would love to include the Chambray Rose pieces into something for my eldest daughter, who sounds alot like your Miss Baby. I have scraps of conversations scribbled on pieces of whatever paper was around as she and her siblings were growing up, all treasured memories. Such soft lovely colors – would love to have them! after my children had all left home, a divorce, new marriage and a new home, I had boxes and boxes of my childrens childhood treasures. I called them all to come over and get their things the following sat. 4 children, 3 step children. we all made a day of it, good food and lots of laughter!. the kids couldn’t believe I had kept so much!!! they laughed at me and sorted and laughed at each other’s kinder treasures. not everything went home with them, but some did. enough to prove to their children that they really were young once. lol. I love listening to your stories. I never thought I was the best mom either, but looking back, I was the best mom my kids could have gotten. i’m not sure any other mom would have survived their teen aged years. haha. keep up the good work mom, you are doing a great job with her. you are teaching her the importance of showing you the work she is especially proud of. I loved her explanation of the picture, it’s amazing how they think things through. I love looking back at the things they make. Love the fabric. Oh, my! Miss Baby must really challenge her teachers. What a story with her picture!!! I really enjoy hearing about her accomplishments and activities–delightful! The fabrics are beautiful–can’t go wrong with denim or chambray! My daughter’s artwork on the back of a church bulletin still brings me to tears, a homeless woman with patched coat, carrying a Bible, with her baby in a carriage. I wonder what the sermon was that morning. I’d love the fabrics, just finished patching that same daughter’s 14 year old quilt. As a former kindergarten teacher, I tried to have my students explain their drawings. I was often amazed at the wealth of knowledge in their little brains. I’m glad you saved the picture. Lovely fabrics. Would love to use these in a quilt.